Good morning friends. I am so excited to have Sydney from Tastefully Frugal here today sharing an adorable printable. Be sure to say hello to Sydney on Facebook and Pinterest and check out her work. 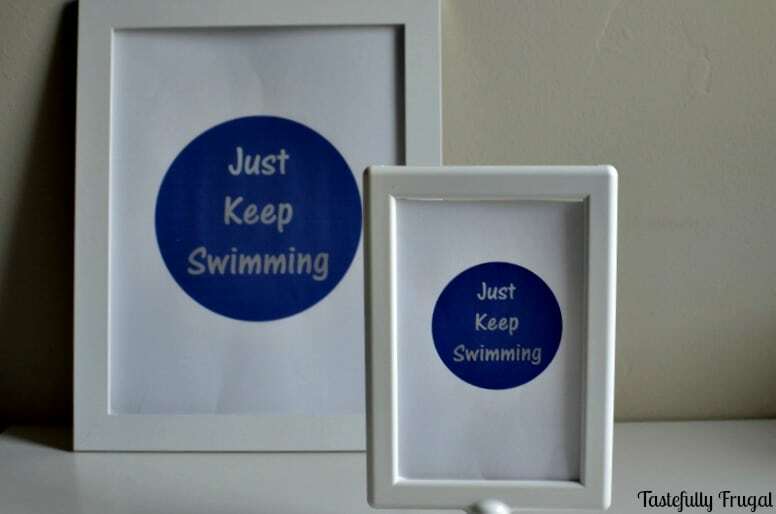 You’ll be able to remind yourself never to give up with this Just Keep Swimming Free Printable. Hey Creative Ramblings readers! I’m Sydney and I share all sorts of frugal living recipes and tips over at Tastefully Frugal. I’m excited to be with you today sharing one of my favorite things. I’m a strong believer in ‘You Are What You Think’. If you think happy and good thoughts, good things will happen to you. If you think unhappy or negative thoughts…you guessed it not so good things will happen to you. I have a quote book that is bursting at the seems with all my favorite quotes and I love reading a few on the days where I feel not so great. It’s definitely an easy way to change my mood and boost my energy. We (my husband and I) recently set up a little office nook in our bedroom and the one thing I really wanted, aside from a desk and chair, were happy thoughts everywhere that would keep my motivated when I needed it the most. I shared my Keep Going French Bulldog print last week and today I wanted to share with you my boys’ favorite quote. 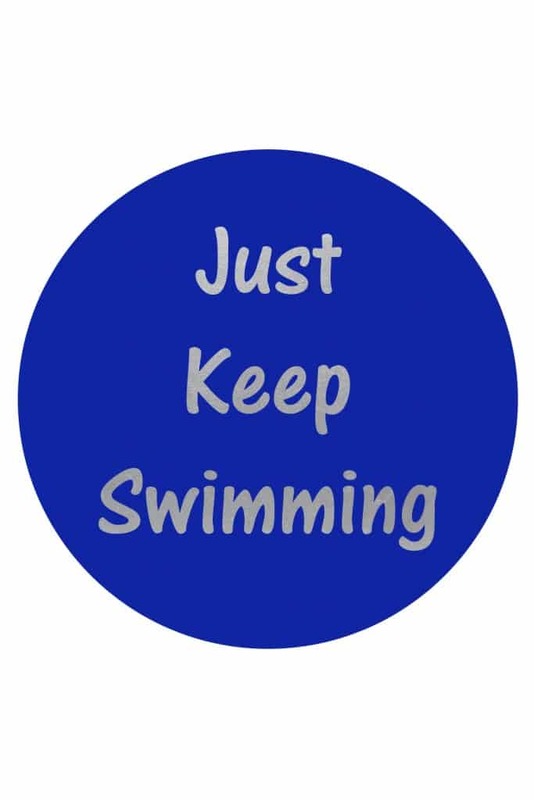 This is such a great reminder for young and old to keep going, keep trying, even when it seems impossible. When I was thinking about my office space I knew I wanted this quote incorporated somehow. I created this print to go in a 4×6 frame on my desk but I decided to print a bigger one for my boys’ bathroom too. They always point to it when they are taking a bath and start singing Dory’s song. I’ve made this print available to you in three different sizes. 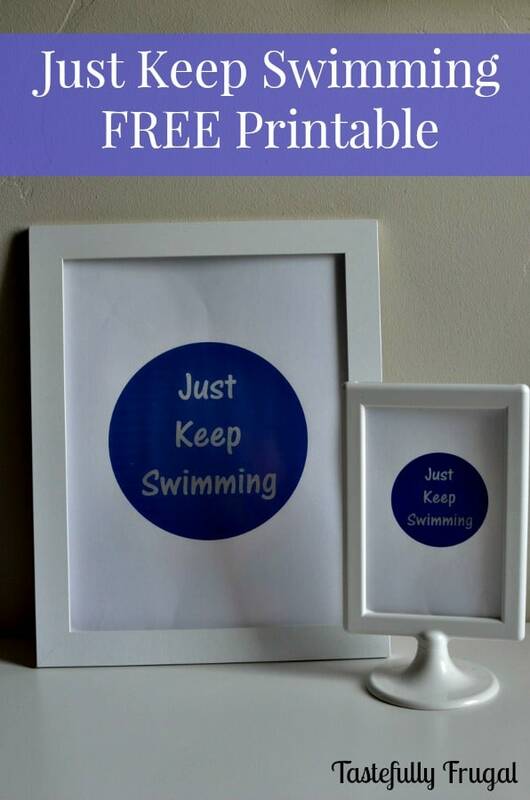 Print yours today and don’t forget “Just Keep Swimming”!